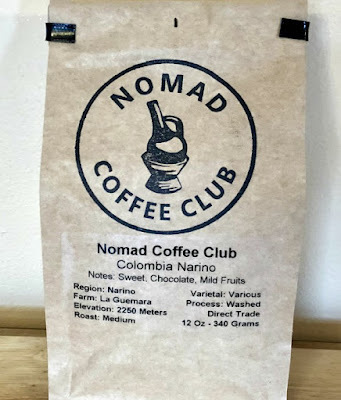 If you're an avid coffee drinker and want the opportunity to try a variety of new coffee blends I highly recommend trying out the Nomad Coffee Club. With their subscription service you can receive a selection of freshly roasted beans from around the world. The nice part is each month you'll get to try a new coffee without having to step foot in a store. I'm not sure if that's my favorite part, or smell of the fresh beans when I'm grinding them. Or maybe it's the aroma of it being brewed. Either way I am loving the first bag from my 3-month subscription. I'm not usually big on anything but mild roasts, but this one was a medium roast and I really have enjoyed it. Maybe it's the blend or that it's so fresh. All I know is I look forward to that aroma and fresh cup every morning when I wake up now. Nomad Coffee Club is available in a 3, 6, or 12 month plan. Or if you're in need of a larger quantity at once they even have a bulk sized office plan. Nomad Coffee Club is a coffee subscription company specializing in eco-friendly and fair-trade offerings from around the world. As part of their mission, they give back a portion of each purchase to their network of farmers to improve sustainable coffee growing.